This is confirmed by Pope John XXIII’s October 11, 1962, opening speech for the Second Vatican Ecumenical Council. The English translation of Pope John XXIII’s opening speech makes eight (8) references to modern times (three references), modern life, modern world, modern theologians, modern thought, and modern expectations. The Spanish translation of Pope John XXIII’s opening speech also makes eight (8) similar references to época moderna, modernas condiciones, tiempos modernos, mundo modern, vida moderna, teólogos modernos, pensamiento moderno, and moderación en los proyectos. Also let there be no doubt – Pope John XXIII’s promotion of modernization flies in the face of The Oath Against Modernism required of him. The same can be said about all clergy advanced to major orders, pastors, confessors, preachers, religious superiors, and by professors of philosophy and theology in seminaries that disregarded their Oath Against Modernism and directly or indirectly participated in the Second Vatican Council. Pope John XXIII (Angelo Giuseppe Roncalli) was ordained in 1904; taught apologetics, church history, and patrology; and most probably took The Oath Against Modernism on September 10, 1910, or very shortly thereafter. Pascendi Dominici Gregis, On the Doctrines of the Modernists, Encyclical of Pope Saint Pius X, Given at St. Peter’s, Rome, on the 8th day of September, 1907. 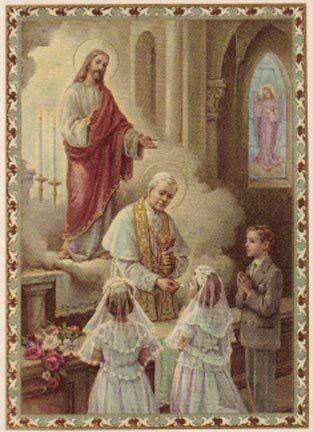 Notre Charge Apostolique, Our Apostolic Mandate (the theories of the Sillon and the Sillonist movement), Given by Pope Saint Pius X to the French Bishops, August 15, 1910. Mirari Vos, On Liberalism, Encyclical Letter of Pope Gregory XVI, dated August 15, 1832. Quanta Cura, On Current Errors, Encyclical letter of Pope Pius IX, December 8, 1864. Quod Apostolici Muneris, On Socialism, Encyclical of Pope Leo XIII, December 28, 1878. Diuturnum Illud, On the Origin of Civil Power, Encyclical Letter of Pope Leo XIII, June 29, 1881. Humanum Genus, On Freemasonry and Naturalism, Encyclical letter of Pope Leo XIII, April 20, 1884. Rerum Novarum, On Capital and Labor, Encyclical letter of Pope Leo XIII, May 15, 1891. Humani Generis, On Certain False Opinions Threatening to Undermine the Foundations of Catholic Doctrine, Encyclical Letter of Pope Pius XII, August 12, 1950. The evidence is overwhelming. Pope John XXIII had to know about modernism and the many anti-modernist objections of his many predecessors. Pope John XXIII clearly disregarded traditional anti-modernism teaching when he tasked the Second Vatican Ecumenical Council to focus on the conditions and modernization (emphasis supplied) of the Church after 20 centuries of life. In so doing, it can be argued that Pope Saint John XXIII’s position on modernism was heretical. In so doing, it can be argued that Pope John XXIII factionalized (traditional versus modernist) the Roman Catholic Church. In so doing, it can also be argued that Pope John XXIII created a schism (Traditional Catholics versus modernist Catholics) within the Roman Catholic Church. At the risk of being redundant, the same can be said about all clergy advanced to major orders, pastors, confessors, preachers, religious superiors, and by professors of philosophy and theology in seminaries that disregarded their Oath Against Modernism and directly or indirectly participated in the Second Vatican Council. Deal with it. We must come to terms with the reality of today’s situation. The Latin rite of the Roman Catholic Church is in schism – a schism brought on by modernist schismatic mutineers. The difference between this schism and other schisms is that in recent history Traditional Catholics (faithful to the Traditional magisterium) remained at the helm and the modernist schismatic mutineers (i.e, Martin Luther (about 1517), Huldrych Zwingli (about 1525), John Calvin (about 1530), John Knox (about 1546), etc.) were cast off to find their own way. This time around the modernist schismatic mutineers took control of the Vatican and Traditional Catholics were left to find their own way. That being said, on October 31, 2017, the modernist schismatic mutineers, at the helm of the Vatican, announced the Vatican will be issuing a special postage stamp, depicting Martin Luther at the foot of the Cross, to commemorate the 500th anniversary of the Protestant Reformation. Let us also recall that it was modernist Pope Francis that canonized Pope Saint John Paul II and Pope Saint John XXIII. Let there be no doubt – Pope John XXIII’s Second Vatican Council promotion of modernization flies in the face of The Oath Against Modernism required of him. On July 17, 1967, the Sacred Congregation for the Doctrine of the Faith replaced Pope Saint Pius X’s comprehensive Oath Against Modernism with a tepid Profession of the Faith. The July 17, 1967 Profession of Faith does not include a declaration by the oath taker that he or she is completely opposed to the error of the modernists. In effect the tepid Profession of Faith reopened the modernist floodgates on July 17, 1967. Replacement of the comprehensive 1910 Oath Against Modernism with the tepid 1967 Profession of Faith raises a collateral issue. Can the Sacred Congregation for the Doctrine of the Faith replace a requirement established by Pope Saint Pius X in a pontifical document (Sacrorum Antistitum)? This smacks of modernist obfuscation. This is an issue best left to canon lawyers and Cardinals. It should also be noted that the Vatican’s online full text of Sacrorum Antistitum (Oath Against Modernism) is available in Latin only – and the Vatican’s online full text of Praestantia Scripturae (Censures and penalties against those who neglect to observe the prescriptions against the errors of the modernists) is only available in Latin and Italian. English translations of the Oath Against Modernism (not full text of Sacrorum Antistitum) were available online (at EWTN and Papal Encyclicals) and in print (Denzinger, 30th edition, paragraphs 2145-2147). It should be noted that the gist of these translations is the same – but there are minor differences in the English translations by EWTN, Papal Encyclicals and Denzinger. English translations of the Praestantia Scripturae (Censures and penalties against those who neglect to observe the prescriptions against the errors of the modernists) were available online (at EWTN and Papal Encyclicals) and in print (Denzinger, 30th edition, paragraphs 2114). Again it should be noted that the gist of these translations is the same – but there are again minor differences in the English translations by EWTN, Papal Encyclicals and Denzinger. By comparison, the Vatican provides full text English, Spanish, French, Italian, Portuguese, and Latin translations of Pascendi Dominici Gregis, On the Doctrine of the Modernists. You have to wonder whether someone in is trying to make research of the Oath Against Modernism difficult. Finally, you also have to wonder whether the post Second Vatican Council Novus Ordo Mass, Ottaviani Intervention, today’s alignment of the Catechism of the Catholic Church with modernism, today’s recent Dubia, and today’s even more recent Filial Correction would have become an issue if The Oath Against Modernism had been taken to heart – by all clergy advanced to major orders, pastors, confessors, preachers, religious superiors, and by professors of philosophy and theology in seminaries that directly or indirectly participated in the Second Vatican Council. ALSO, EVERYONE READING THIS NEEDS TO TAKE A STAND AND DO SOMETHING IN THEIR PARISHES, DIOCESES AND FAMILIES. DO NOT WAIT. BE KIND, BUT START NOW. START BY NOT RECEIVING FROM PHONY LAY MINISTERS UNLESS THERE IS AN EMERGENCY. SPEAK OUT NOW!!! RESIST!!! OBJECT!!!!!! A Syllabus of Errors is going to have to be issued to repudiate everything Vatican 2 did not say, as well as correct parts of Vatican 2 and subsequent Documents that had ambiguity in them. Bishop Schneider wants to do it as he has stated numerous times for LifeSite. Trash the parts of Vatican 2 that turned out wrong. Trash it. Get rid of the phony “Eucharistic Ministers”, the “Stay as you are” Mentality for immoral situations. Fix it. It needs to be trashed in its entirety. Everyone needs to grow up, Cardinals and Bishops need to put their Big Boy Pants on. Come on Cardinals and Bishops, do your job and repudiate Beroglio the Monster. Put Benedict in power. If he resigns truly now after being restored, because he is old, fine. Either way let’s get a Holy Pope in place to finish what Benedict Started. The Cardinals and Bishops need to forget the modernist mentality. Restore the Church. Get it over with. The Cardinals and Bishops who go along with this are tantamount to the Establishment Republicans who aren’t really doing anything but just talking.